Relatedly, economists have claimed that central banks have placed an undue emphasis on the state of government security markets. The Bank of England, in particular, has been criticized in this vein. 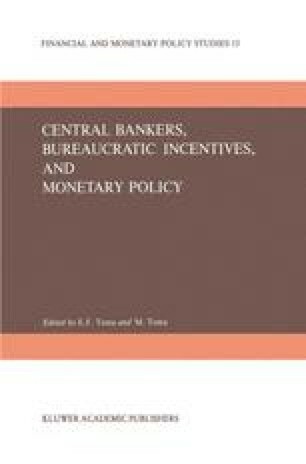 (2) Despite the well documented problems in defining social preferences, an implication of such statements is that central bank’s preferences differ from the public’s priorities. Except for vague statements about the inherent conservatism of central bankers, economists have not contributed substantially to an understanding of this important phenomenon. The research for this paper was financed by a grant from the Institute of Public Administration of Canada. The authors thank G. S. Gordon, W. P. Yohe, and P. Laverty for their helpful comments and Michael Joyce, whose contribution went well beyond his role as research assistant. The comments of Tom Courchene have pressed us toward greater clarity in our arguments. The present paper is an elaboration of parts of a paper presented at the meetings of the Canadian Economic Association in June, 1970.